It’s been a week for weird fiction, that’s for sure. Starship And Haiku came home with me from the used bookstore because it looked oh so strange. And as far as strangeness, it didn’t disappoint. A post apocalyptic story, Starship and Haiku has something to say about clashing cultures, honor, communication, and survival. It succeeds grandly in the sense that it’s ambitious, unique, and strange. But does it succeed in being a good book? When Josh was ten years old, the skies over his home in Hawaii exploded. People rushed to the shelters as fast as they could, and that was the night his brother Didi was born. Now an adult, and responsible for his brother’s welfare, Josh works at a hospice for plague victims. Called “stranges”, some plague victims suffer radiation poisoning, others have odder diseases that come with telekinesis or precognition. Even Didi is technically a strange – he’s never spoken a work, and has been diagnosed as being mentally retarded. Didi may not have the power of speech, but he’s the furthest thing from being retarded. In fact, if he could just learn to harness his inner voice and his telepathy, he could “talk” to Josh all he wanted. One evening, Didi sees a dying beached whale, and he has a telepathic conversation with the whale. The whales are in love with death, and see death as the ultimate beautiful act. Didi doesn’t view death like that, but he respects the whale’s alien thoughts, and Didi starts understanding how to speak in the ideogram language of the whales. Across the ocean, a Triumverate of powerful men rule in Japan. Most of the radiation is on the other side of the planet, so Japan, now a superpower, sees very little plague, and very few birth defects. The rulers have promoted a return to traditional values and beliefs, as a way of bringing the population back to a sense of comfort and normalcy. Akiro Ishida has discovered an abandoned Russian space shuttle in orbit around the Earth, and hatched a plan to get an international group of humans up to the ship, and out into space, in an attempt to start over. He wants his daughter, Ryoko, to be part of this trip, and as part of her education she is sent to observe the situation in Hawaii. On the way, Ryoko has a telepathic experience with a whale, where she learns that the Japanese people came into being because the whales dreamed them into being. Many people of Japanese descent share genetic memories with the whales, which is the only reason the whale was able to communicate with Ryoko in the first place. The whale also telepathically changes her genetic code, and sort of impregnates her (she describes herself as impregnated, but I couldn’t quite figure out how this worked, or how it happened. It was very glossed over). She’s carrying the genetic code that will help humanity reach the stars. Ryoko interacts with Josh and Didi on Hawaii, and Josh asks her about jobs in Japan. He so desperately wants to escape Hawaii, to quit working at the hospice, to no longer be surrounded by dying people and glass beaches. When Ryoko returns to Japan, she tells her father about her experience with the whale. The triumvirate fights for power, decreeing that the Japanese people, as a whole, are so ashamed of having hunted their spiritual ancestors to near extinction that they must pay for this sin as a people, and honorably commit suicide. Japanese families commit honorable suicide in droves. Those who are too weak to take their own lives are invited to simply kneel and wait for a band of roving Samurai to visit their village and kill them. Josh and Didi see themselves as American, but they are of Japanese descent. When they reach Japan, they are reunited with Ryoko, and captured by the surviving members of the triumvirate. They are brought to an old amusement park, which has now become a place people can come for assisted suicide. Josh thinks it’s pretty ironic, he wanted to escape working at a hospice, and now he’s at an absurd assisted suicide clinic. For days, the trio is exposed to recordings that will brainwash them into yearning for honorable suicide. Josh things the whole thing is crazy, Ryoko is beginning to think about taking her own life, and Didi is doing everything he can to keep his brother and their new friend alive. weird, but brilliant, because I’ve never seen a thought communicated like that. Can you imagine what an author like China Mieville could do with something like thing? I know that Josh is is supposed to be an adult, thirty years old, but it’s hard to take him seriously because he acts like a spoiled teenager. When I viewed him as a fifteen year old, and Didi as a ten year old, their reactions to everything around them and Josh’s awkward romance with Ryoko became more plausable. The toughest part about this book for me was wrapping my head around honorable suicide. Ryoko’s father and the other members of the triumvirate are obsessed with this practice, to the point where they make it a requirement of their followers and murder anyone who won’t obey. I don’t know enough about Japanese history or culture to understand the subtleties of this practice, and when it would be appropriate. The way it’s presented in the book is basically the leaders of Japan saying “when we’ve lost face, this is our way honorably making things right”, and Josh responding with “you are a lunatic”. Everyone we meet in the book experiences culture shock, and no one really has the first clue how to even begin useful communications. Maybe that’s what the authors was getting at, how terrible we are at communicating especially when we immediately view the other party as weird, or crazy, or strange, or simply “the other”. Since we can barely communicate with each other, how could we ever hope to communicate with an alien intelligence? Somtow Sucharitkul was born in Thailand but raised and education in England. He is an author in the science fiction and horror genres, but makes his living as musical composer. He won the John W. Campbell award in 1981 and Starship and Haiku won the Locus award for Best First Novel in 1982. He a won a World Fantasy Award and been nominated 4 more times. Starship and Haiku has the promised haikus, telepathic whales, awkward romance, lots of people killing themselves, and a cop-out ending. One very weird book, and the good bits weren’t good enough to outweigh the weird and often disturbing. This one didn’t work for me, but since Sucharitkul was nominated for prestigious awards so many times, I may have to look into his other novels. 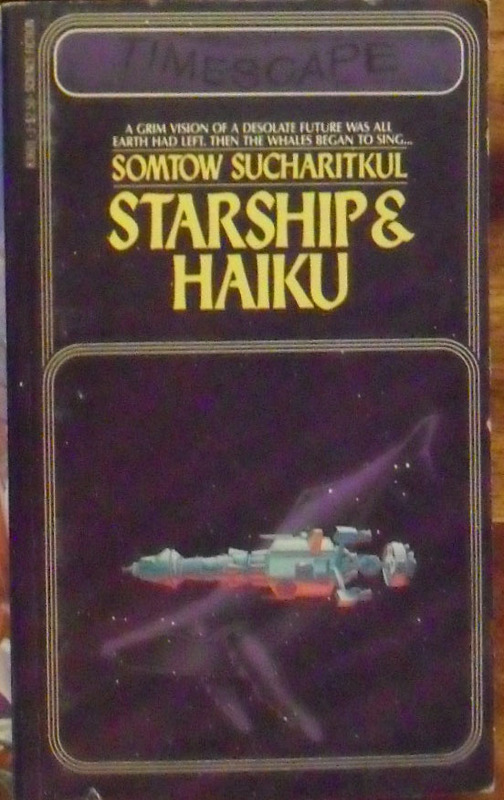 9 Responses to "Starship and Haiku, by Somtow Sucharitkul"
I’m ecstatic that you reviewed this. The Japanese aren’t quite as into suicide as they are occasionally portrayed; someone has probably been watching too many Shogun reruns. I’d have to read the book though to give accurate critiques though. I can’t decide if I wish it was cheesier and more disastrous, or happy that it is at least thought-provoking and original. The suicide bits were incredibly over the top, nearly coming all the way around to Catch-22 style satire. Reading this completely out of the context in which it was written, I have no idea what the author’s intent was. 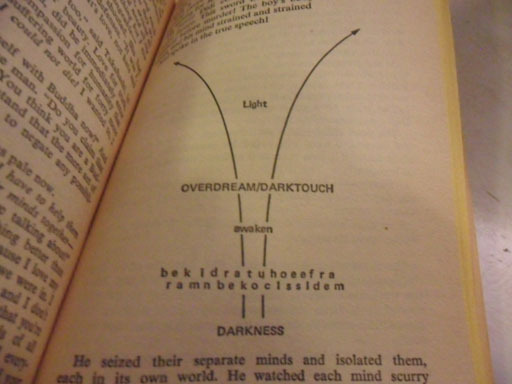 I think the only Sucharitkul book I ever read was Mallworld. Definitely strange stuff. Glad to see you’re alive and well and still reviewing some great books! and you as well! How have you been? I’m just thankful that someone else has heard of and read this author. what was the premise of Mallworld? Well, no, I won’t be reading this. My brain hurts just thinking about it all. I realise that I’m a one cell but what can I say. I’m just a happy amoeba. spend your time (and brain cells!) on books that are more enjoyable! I hate that it sounds like I totally knocked the book, there were some interesting aspects, but it just got too weird for me. 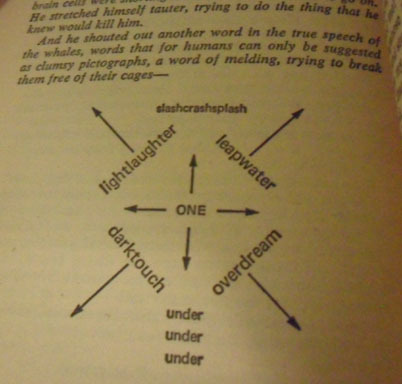 also, I’m crazy enough to read short little obscure books with weirdo titles!